It’s a New Year and inevitably, you are going to hear us talk about resolutions, so I might as well get it out of the way from the start. 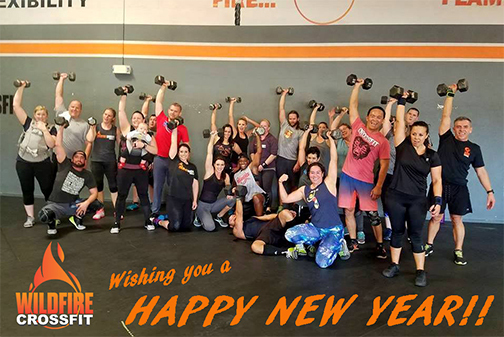 The good news for a strong majority of the people reading this, since the top 2 New Year’s resolutions are getting in shape and eating better, as a member of WildFire, we’ve got you covered. Many of you may have started at WildFire because of a resolution. It’s estimated that 50 percent of the U.S. makes resolutions each year and the fact that you are already a part of a Community where people are dedicated towards improving their lives through fitness and nutrition, you are on the right path. Everyone is different. For some, Resolutions and Goals are crucial for their success. Others hear the “R” word and cringe, often because it brings feeling of guilt and anxiety. Others still have just never taken the time to sit down and focus on what it is they really want. The good news is, no matter which of the three you are…it’s all good! This week we are going to talk a lot about Resolutions, Setting Goals, and finding areas where we can improve. We are going to give you some tips for success when setting goals and making resolutions. We are also going to give some tips for re-framing how you think about resolutions. For today, the message: No matter what your past experience, we are here for you! For help with setting goals or focusing on an area of improvement within the spectrum of fitness, nutrition, and personal growth contact us and we will set up a time to meet. Text us at: 480-626-0905 with your Name and the best time of day to meet and we will get you scheduled right away so you can hit the ground running. Stay tuned this week as we continue to post great content and tips so you can have all the success you deserve in 2018!! For strength, we are putting some volume into those Deadlifts to improve stamina. The whole point is to be able to hold onto the bar the whole time. This will have a dramatic impact on workout such as “Grace” where it is helpful to be able to hold onto the bar for large sets. The Death By always starts out pretty boring with a lot of time for rest. And before you know it, you have no time left and you are racing to finish to make it into the next round. Here’s how it works. Much like an EMOM (Every Min on the Min), there is a specific number of reps to be performed in each minute. In a “Death by” workout, every minute, the number of reps goes up, increasing the level of intensity, until you can no longer perform the required amount in the minute. Focus on going Unbroken with a steady pace on those Wall Balls and conserve your energy as much as possible on the burpees.